I tried Blue Apron for the first time last month. I heard about it from a friend. I was pleased with the four menu choices – vegetar ian, poultry, fish, and red meat. 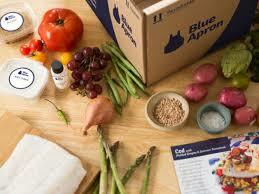 Blue Apron delivers to Ponte Vedra Beach on Wednesdays only and delivers two dinners in each box. Total cost for was $70 for both meals which I thought was high, but I guess if you think about shipping it’s about right. My family loved the chicken tacos that we cooked the first night. However, the recipe was very time-consuming. It took over an hour to complete all of the chopping and preparation to cook the meal. However, the end result was amazing! The next night the recipe was seared salmon over a quinoa salad. This recipe was not nearly as complex and only took me 30 minutes to prepare. We enjoyed this dinner as well. My favorite part of Blue Apron is that all of the ingredients (even spices) arrive in the box so there is no need to go to the grocery store. I also enjoyed trying the new recipes – very fun for a change. Blue Apron serves four people per dinner. So for my family of give that is a problem! I need to make sure when I am ordering that someone in my household won’t be home, or someone will go hungry. Overall, Blue Apron is a fun alternative to my regular weeknight dinners! Not something I will do weekly, but nice to add in once a month.